There have been some pretty big changes at Roush Fenway Racing since the 2015 NASCAR season ended. It was a season that saw the organization win the XFINITY Series championship with driver Chris Buescher, but also saw results on the Cup side that were not up to the level of expectation they had for it when they attended the preseason Media Tour last year. Change is not always good, at least not immediately, but it appears that last year’s “hope and change” primed the pump for bigger and better things this season. Buescher moves up from the XFINITY Series to a full-time Sprint Cup ride with Front Row Motorsports, which now has a much stronger alliance with RFR, wrapped under an even bigger and bolder Ford umbrella that has all of the Ford teams super-psyched about the upcoming season. Landon Cassill also joins Front Row as Buescher’s teammate, providing that organization with two hungry young racers poised to make their mark in Cup. Well-seasoned crew chief Bob Osborne slides over to the No. 34 Front Row team to call the shots for Buescher, giving that group the type of veteran leadership they need to march forward. Buescher’s 2015 XFINITY Series Teammate Darrell “Bubba” Wallace, Jr. added that he thought the consolidation of the operation into one shop “is huge” and that he was happy to have Selfeo on the car for Daytona. Wallace will again have Ryan Reed as his teammate in the XFINITY Series, as Reed will wheel the Lilly Diabetes No. 16 Ford for the second-consecutive year. Ricky Stenhouse returns with his team intact from last season — and he also talked about some late-season momentum that he feels they can carry into the new year. The team’s “ageless veteran” Greg Biffle will have Brian Pattie in the crew chief slot for his 2016 effort, with Kentucky Fried Chicken joining his list of corporate partners beginning with the season-opening Sprint Unlimited and Daytona 500 in February. 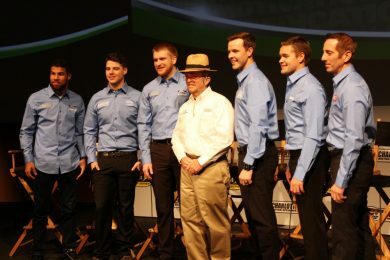 Team co-owner Jack Roush put a bow on the team’s positive vibe. Tom Baker is the Owner and Senior Editor of Race Chaser Online, as well as creator of the Stock Car Steel/SRI Motorsports Show — airing Thursdays at 7 p.m. Eastern on the Performance Motorsports Network. With 27 years of motorsports media, marketing and managerial experience, Baker serves as coach and mentor for several next generation racers, as well as Race Chaser Online’s passionate lineup of rising motorsports journalists.